I've been blogging a lot more compared to 2009, and on a few topics I'd never have thought I'd blog about. For instance, I'd never have penned something about my parents, if not for BlogAdda's Father's Day and Mother's Day contests. If not for their 'Moments of Madness' contest, a lot of my childish stuff would have never gotten showcased to the blogger world. And to think about it, I won an award for that entry too! Life has many small things which are beautiful, worthy of some expression of thought! And a blog helps realize those. 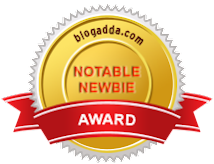 Thank you BlogAdda, for featuring me as the notable newbie of the day! Something that made my day!